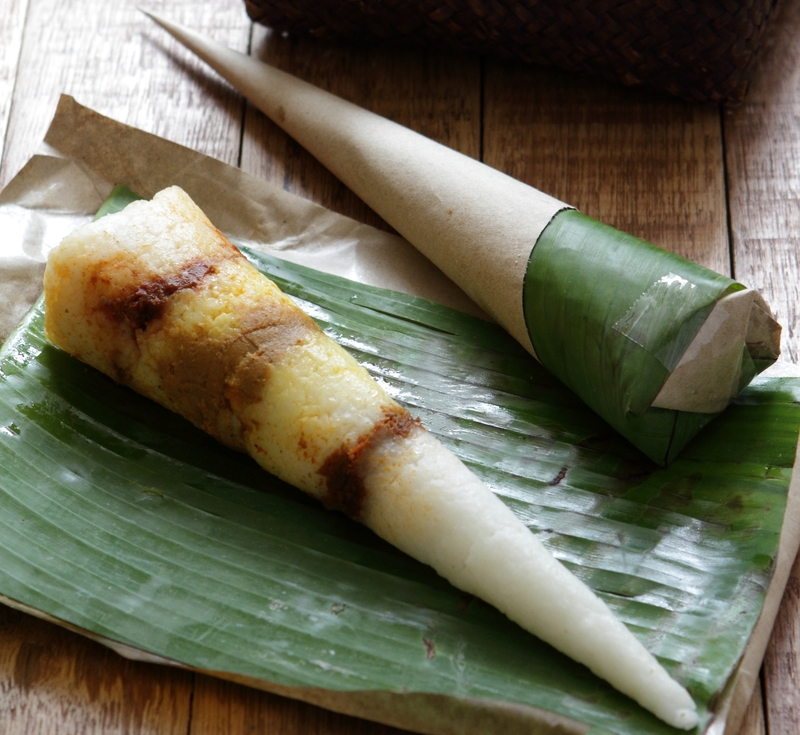 Originating from Kelantan, nasi tumpang is said to have been born out of necessity. Rice and condiments were packed in a banana leaf cone, so that farmers could take them to the sawah padi (paddy fields) for lunch. Place the ingredients in a rice cooker and boil until cooked. Place shallots, garlic, dried chillies and ginger into a blender and blitz to a paste – add some water if necessary. Place the oil in a pot over medium heat and sauté the paste for 5 minutes, until fragrant. Add the asam keping and coconut milk and cook until mixture reduces by half. Remove the asam keping. Add the shredded fish and season. Cook, stirring, until it becomes floss, about 45 minutes. Place the chillies, onion, garlic, ginger, galangal and water into a blender and blitz until smooth. Heat the oil in a pot over medium heat and pour in the blended mixture. Sauté the paste for 5 minutes, then add the curry powder and jintan manis and sauté for another 3 minutes. Add the shrimp, coconut milk and seasoning and cook until mixture reduces by half. Place all the ingredients, except the oil, ikan bilis, and tamarind into a blender and blitz until smooth. Place the oil in a pan over medium heat, then add the ikan bilis. Fry for 2 minutes, then add the blended ingredients. Sauté until fragrant, about 5 minutes, then add the tamarind and leave to cook for 10 minutes, until mixture has thickened to a paste. Scald the banana leaves in boiling water to soften, then pat dry. Shape the leaves and waxed paper, if using, into a cone with a 4cm diameter base. Secure with bamboo picks or sticky tape. Fill a cone with 2 spoons of rice and press tightly. Add a spoonful of serunding, then alternate spoonfuls of rice, gulai udang, rice again and sambal ikan bilis. Fold the bottom of the leaf to close the cone and secure with sticky tape.